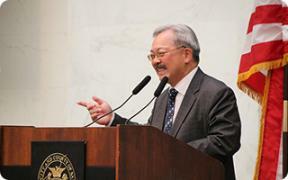 Mayor Edwin M. Lee, Supervisor Jane Kim and City College Acting Chancellor Susan Lamb announced that starting next school year City College will be accessible for all California residents living in San Francisco and taking courses for credit. Additionally, the new program will offer financial assistance for low-income students with a grant to fund books, transportation, health fees and other expenses. “As a child of working-class immigrants, I know first-hand the importance of a college education and the struggles to pay for it,” said Mayor Lee. “Working together, we found an economic plan that would make City College accessible to our city residents and give additional support to those students struggling the most. This commitment will provide our residents the opportunity to attend college, continue to learn and create better lives for themselves. This is an investment in our youth, in our city and in our future."